If you’re thinking of buying a nautical bar globe, there are some things that you should be aware of. I’ll talk about these aspect later. 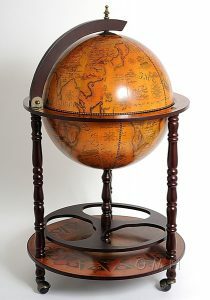 Even though there is no such official classification, I like to group antique reproduction globe bars and world globes into 4 category types: terrestrial (also called earth globes or geographical globes), celestial (also astronomical globes or armillary spheres), nautical (also maritime globes) and decorative. Terrestrial globe bars display a map Earth or other planetary body and relate to the planet’s topography. Celestial ones show the heavens and the positions of the stars in the sky (they do not include the sun, moon or planets because the positions of these bodies vary relative to those of the stars). Nautical bar globes depict the seas and oceans. And the purpose of decorative globe drinks cabinets is self-explanatory – to look pretty. A nautical drinks cabinet is also a wonderful gift for boaters, sailors, and anyone who is a lover of the water. It can also be a godsend when trying to find a gift for a maritime memorabilia collector who has his or her share of the usual nautical gifts: anchors, steering wheels and model ships. One thing not many people know is that nautical globe bars are almost always made in China, as opposed to their Italian counterparts. Zoffoli is actually the only Italian manufacturer still in business that makes bar globes, and all of theirs, even the modern ones, have terrestrial maps. Italian globe bar furniture is made by hand and the maps are carefully reproduced by qualified cartographers. This is not the case with nautical bar globes. The quality of the mass-produced Chinese globe bars is often sub-par. Since bar globes can open to reveal a storage area for liquor and stemware inside, the map on the sphere has a seam running along the middle, of course. 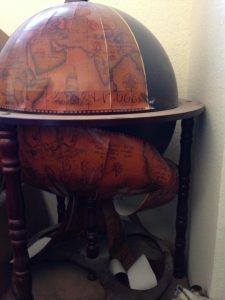 In my experience the biggest complaint by customers who purchase nautical globe bars is that when the globe sphere is closed the northern and southern hemispheres often do not line up.